Pure musical pleasure. But not just that. By the second song of their latest Cafe Carlyle gig, Herb, Lani and the boys are already improvizing into the stratosphere with outlandish zest, in a version of “Chattanooga Choo Choo” which features the most tasteful, sophisticated and syncopated use of synthisizers and drum machines I’ve ever heard in my life. I mean, come on! Trumpeter Herb Alpert is most associated with his group the Tijuana Brass, and was also a recording industry executive – he is the “A” of A&M Records, which he founded with business partner Jerry Moss. His wife Lani Hall sang with A&M artist Sergio Mendes and Brasil ’66, most famously on their hit version of “Mas Que Nada”. 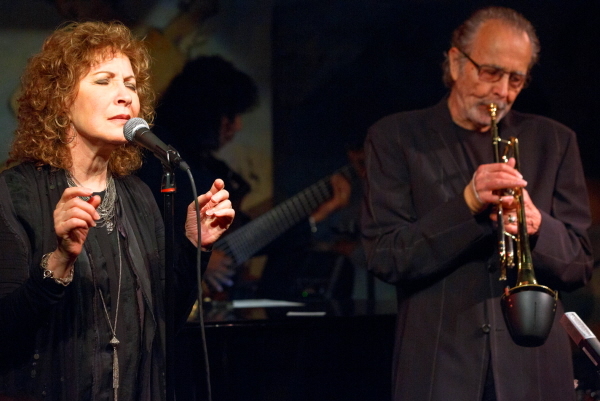 In the act at the Carlyle they perform selections from Alpert’s latest album In the Mood (which features that groovy “Choo Choo”), as well as the two albums they’ve recently recorded together, plus medleys of Tijuana Brass and Brasil ’66 hits. I can’t overstate the impressive and exciting musicianship in this act. Alpert has structured the songs in intricate ways that leave abundant room for improvisation. They may play the same songs from night to night, but musically every performance will be utterly different. Alpert is a breathtakingly soulful player, and Lani has that kind of liquid crystal voice that songwriters dream of. For example, Alpert dropped the melody from Rodgers & Hammerstein’s “It Might As Well Be Spring” into brilliant Brazilian songwriter Edu Lobo’s “Viola Fora de Moda”, provoking appreciative smirks from Lani and pianist Bill Cantos, and inspiring several minutes that lifted the gorgeously melancholy Lobo song into something more playful and sun-kissed. Stunning. News: “NAFTA comedy” I’m directing opens TONIGHT!